LENTILS,nutty and earthy in flavor, a high nutritional property have become a tasty staple in die,which is low in calories,high in nutrition are the perfect legume to eat in summer as salads,crudite and crackers,spreads as an item on a vegetarian dinner plate. 1. HEART HEALTH :- Lentils as a high fiber foods with folate and magnesium,which are big contributors to heart health.Folate lowers homocysteine levels,a serious risk factor for heart disease and Magnesium improves blood flow,oxygen and nutrients throughout the body.Low levels of magnesium have been directly associated with heart disease,hence eating lentils will keep heart healthy. 2. LOWER CHOLESTEROL :- It helps to reduce blood cholesterol since it contains high levels of soluble fiber.Lowering cholesterol levels reduce the risk of heart disease and stroke keeping arteries clean. 3. WEIGHT LOSS :- Lentils include beneficial nutrients like protein,fiber,vitamins and minerals which are low in calories and contain virtually no fat.One cup of cooked lentils contains only about 230 calories,but still leaves feeling full and satisfied. 4. 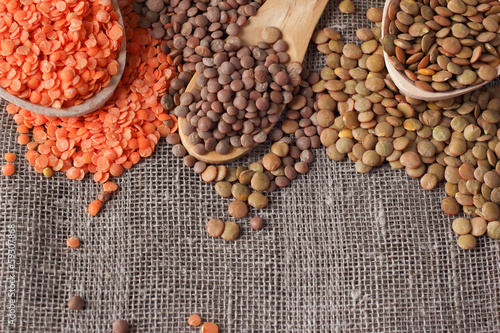 GOOD PROTEIN :- Lentils contain the third highest levels of protein.26%of lentils's calories are attributed to protein,which makes them a wonderful source of protein for vegetarians and vegans. 5. INCREASES ENERGY :- It increases steady,slow burning energy due to its complex carbohydrates and fiber.Lentils are also a good source of iron,which transports oxygen throughout the body and is key to energy production and metabolism. 6. STABILIZED BLOOD SUGAR :- Soluble fiber traps carbohydrates,slowing down digestion and stabilizing blood sugar levels.This can be especially helpful for those with diabetes,insulin resistance or hypoglycemia. 7. DIGESTIVE HEALTH :- Lentils have insoluble dietary fiber which helps to prevent constipation and other digestive disorders like irritable bowel syndrome and diverticulosis.